The USS Enterprise gets a gold-plated refit in a new bobble releasing at San Diego Comic-Con in July. A swanky new USS Enterprise bobble will boldly go to San Diego Comic-Con this July, covered in 24-karat gold. The classic "Star Trek" ship has been revamped by Bif Bang Pow! to help celebrate the franchise's 50th anniversary. 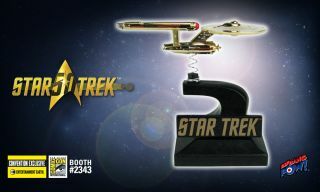 Only 1,260 of the little ships will be made, numbered with a holographic sticker, and they'll be sold for the first time at Comic-Con, July 20 to 24 (Booth #2343) for $60. If any are left over, they'll be shipped to people who have preordered on the Entertainment Earth product page. The ship is attached by spring to a stand, so it can bump along when you attach it to a monitor or car dashboard with an included adhesive pad. The whole ensemble is 2.5 inches long and 2.5 inches tall (6.35 by 6.35 cm). There has been an influx of "Star Trek" baubles and toys (including flyable drone and Mega Bloks takes on the Enterprise) for this anniversary, but collectors aren't the only ones who are celebrating the milestone. Since "Star Trek" debuted on TV on Sept. 8, 1966, there have been five TV shows and 12 movies — and soon, one more of each will add to the count. The latest film in the rebooted "Star Trek" series of blockbusters, "Star Trek Beyond," premiers July 22, and there's a new "Star Trek" TV series that's set for January 2017. Although it comes out after the movie, the new series will be unrelated, and will feature new characters. So get ready to explore the final frontier of anniversaries — set phasers to "fun."